Home » Will the "heirs" of Merkel be able to compete with Macron? Will the "heirs" of Merkel be able to compete with Macron? After the departure of Angela Merkel from the post of head of the CDU, the party will elect a new chairman, who may become the next chancellor of Germany. 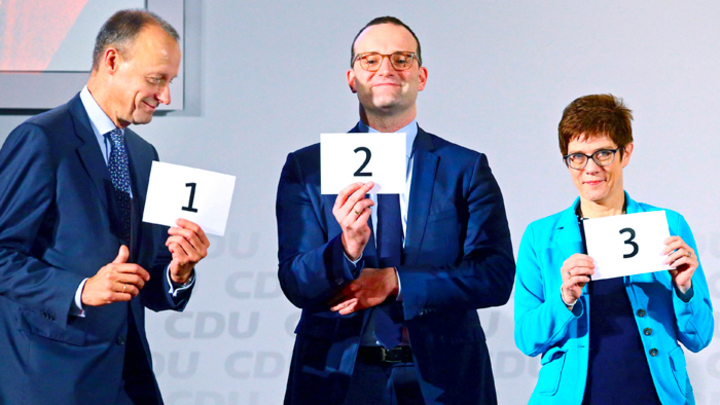 The favorites are Friedrich Merz, Annegret Kramp-Karrenbauer and Jens Špan. Can they impose competition on French President Emmanuel Macron as EU leader? The Christian Democratic Union (CDU) on December 7 will decide on the new head of the party, which will replace the resigning German Chancellor Angela Merkel. The fate of German and European politics depends on this appointment because the current chancellor is the undisputed leader of the European Union. Merkel, on her shoulders, is dragging on European integration, pushing through decisions on migration, the euro budget and sanctions against Russia. Who will replace her? And will they be able to support this dynamic? The last meetings of the CDU identified the leaders in the struggle for the post of head of the party. For the time being, polls give priority to CDU General Secretary Annegret Kramp-Karrenbauer - about 40% of the conservative party’s supporters are ready to vote for her. Kramp-Karrenbauer, an ardent supporter of Merkel, organized her campaign and supported the chancellor’s migration policy. In European politics, she will continue Merkel's course. Despite criticism of domestic politics, Merz supports the deepening of European integration and reforms proposed by the French President Emmanuel Macron. That is, he is not a Euroskeptic. He recently supported the idea of creating a European army and strengthening the eurozone. The third candidate (10%) is the Minister of Health Jens Špan, an open homosexual who calls himself a "burkaphob" and also opposes migration. But, unlike Merz, Špan, along with Kramp-Karrenbauer, does not drown Merkel. Reluctantly, he called the decision to open the doors to the refugees "logical" taken in an "exceptional situation." Špan - is a supporter of European integration. Špan calls for greater integration in the digital sphere so that the EU can compete with China and the United States. He didn’t regret so much about anything as the withdrawal of Britain from the EU. Špan calls for free trade with London and Washington. But at the same time, the Minister of Health criticizes reforms in the euro area. As you can see, all three politicians are in favor of European integration. Kramp-Karrenbauer has a much lower chance of becoming a leader in the EU than Merkel’s because she doesn’t want any renewal. Since 2015, the alignment of political forces has swung towards the right - their positions have strengthened in Austria, Italy, Germany, and Sweden. Špan has more chances because of his critical position on migration issues, but he lacks support in the CDU. But Merz really can fight with Macron, using his experience and business connections in the United States. As for Russia, all the candidates for the post of head of the CDU and the German Chancellor are supporters of sanctions and a hard line against Moscow. What to expect from the successors of Merkel?